Connecticut's Hartford Courant reports that over 500 people were at Camp Laurel in Lebanon on Wednesday, August 8, for the Girl Scout International Camporee Visiting Day. 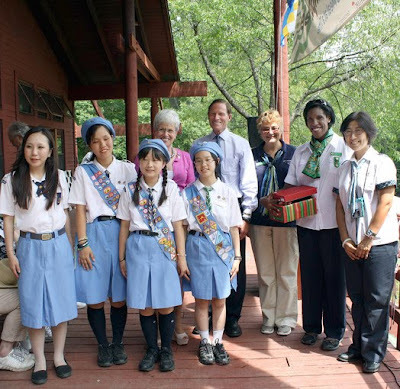 The all-day event was open to ticketed visitors, guests, family and friends of Girl Scouts to give them the opportunity to experience international cultures and cuisines, while meeting the 90 international participants during the International Camporee. Girls from Australia, Canada, England, Ghana, Nigeria, and Japan shared dishes from their home countries, while many performed traditional dances or put on fashion shows, featuring clothing from their lives at home. Lt. Gov. Nancy Wyman, Girl Scouts of Connecticut's honorary spokesperson for the 100th Anniversary, and United States Sen. Richard Blumenthal (D-Conn.) were on hand to speak to the crowd. "You are our future leaders," Wyman said. "Somebody here might discover the cure for cancer. I know you can do it. I'm really comforted that you're here and that you are going to be those future leaders." Blumenthal commended the girls for working on the International Camporee's theme of "changing the world - one meal at a time" and working on ways to end world hunger. "Nothing is more important than winning the war against world hunger," Blumenthal said. "You can change the world, one meal at a time. It's a great saying. I'm going to take it down to Washington with me and brag about what you're doing here at Camp Laurel, coming together from all around the state, all over the country and all over the world."